Laura is available to present Alexander Technique workshops for your department, institution, ensemble or other organization. Please use the contact form for workshop inquiries and fees. Check the Alexander Technique Events page for upcoming workshops. Alexander Technique workshops are interactive, and use individual and partnered movements to explore the Alexander principles of direction, inhibition, end-gaining, and the psycho-physical connection. They can be purely a class presentation, or can be coupled with individual hands-on work, or a masterclass in which participants play or sing, and learn to integrate Alexander principles into activities. Addresses how Alexander concepts can lead to greater poise and more efficient body use in daily activities such as sitting, standing, walking, working at a computer, or playing an instrument. This series of classes is designed for summer camps and festivals. Expands the basic introductory workshop into three to five classes, going more in depth into Alexander principles and how to directly apply them to everyday or specific activities. Involves more individual attention and hands-on work. Develop an understanding of body use, kinesthetic sense, and key Alexander principles related to musical practice and performance. Learn to direct the head forward and up, heighten the mind-body connection, and explore "whispered AH" breathing. Relates these principles to the coordination of the body in regards to sitting, standing, holding an instrument, and freedom of the breath while playing or singing. Designed for musicians: a brief introduction to the Technique, followed by more focused exploration of the breath and how to develop a natural approach to breathing while playing or singing. Address the physiological procedure of breathing, and how the quality of the breath can impact tone production, resonance, projection, and endurance. 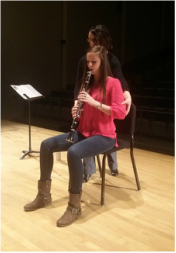 Uses movement and key Alexander Technique concepts to address body issues faced by double reed players such as hand position, jaw position, and efficient breathing. Addresses playing with freedom and avoiding tension, as well as standing and seated playing positions. Dr. Medisky was a featured guest clinician at Georgia State University in both 2012 and 2015. She engaged the students with her personal story of finding Alexander Technique as well as the AT philosophy. She demonstrated the techniques with several students in a masterclass setting, and there was a remarkable improvement with all the students she worked with. 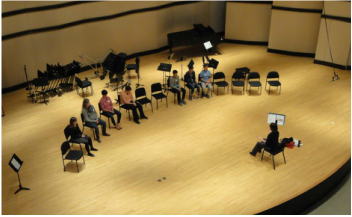 Laura Medisky's 2012 Alexander Technique Residency at Bowling Green State University's College of Musical Arts was a tremendous success and produced many lasting benefits. 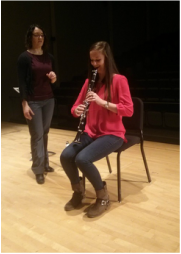 She taught several master classes and about 30 private lessons to music students. Laura is an extremely effective teacher and is especially well-suited to working with musicians as she is a fine musician herself and is experienced working with musicians. I recommend her very highly. Dr. Medisky’s Alexander Technique workshop was immensely helpful for the students in our wind conducting graduate program. They became immediately more aware of their bodies and how to use them effectively.